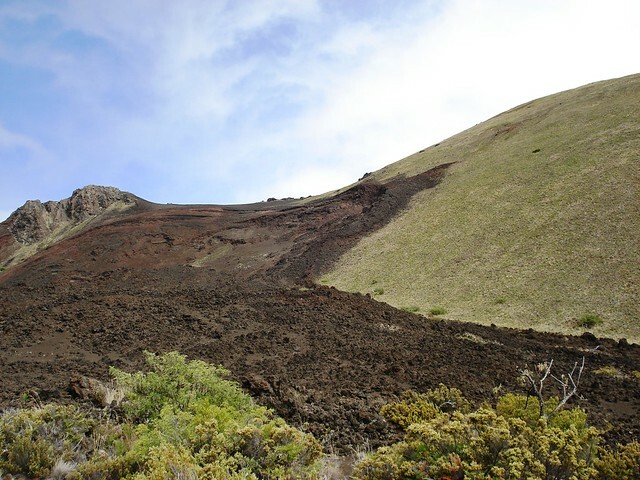 Out of the hundreds of thousands of people who visit Haleakala National Park on Maui, only a small percentage will hike in the crater and stay a couple days. Be one of the lucky ones who do. 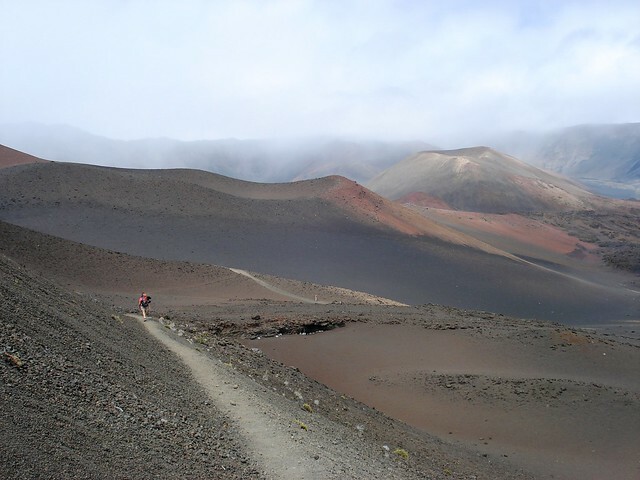 You will venture into a desert-like landscape sculpted by the volcano and wander through colorful cinder cones and lava fields. 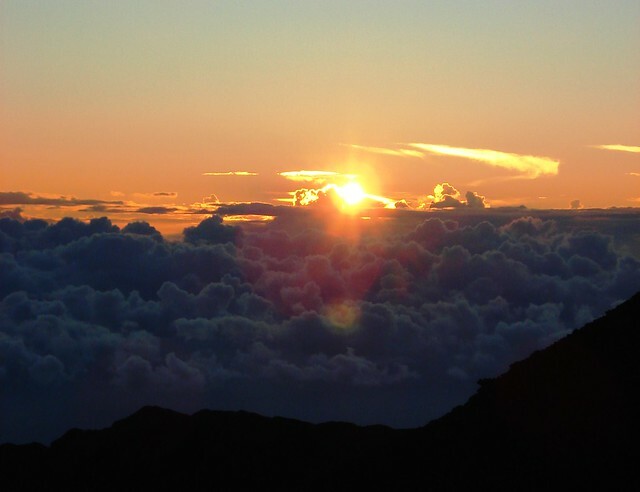 Haleakala means “House of the Sun.” Its summit rises 10,023 feet. Watching a sunrise is popular from up top and many people who visit get up before dawn to catch it. Little do they know that there is a lot more to Haleakala than a beautiful sunrise. The day before your trek, check in at Park Headquarters to pick up your permit for tent camping. Cabins are available; however you must reserve them in advance. Call the headquarters for details. On the first day, park at the Halemau`u trailhead, then hitch a ride up to the top. There is a designated area for hitchhikers next to the lot. Your journey begins at the Sliding Sands trailhead next to the Visitor Center. The hike down is fairly easy and the scenery is spectacular. It did not take long for my husband and I to feel remote and far away from bustling crowds. Silverswords dot the sides of the trail and grow to about 6 feet. 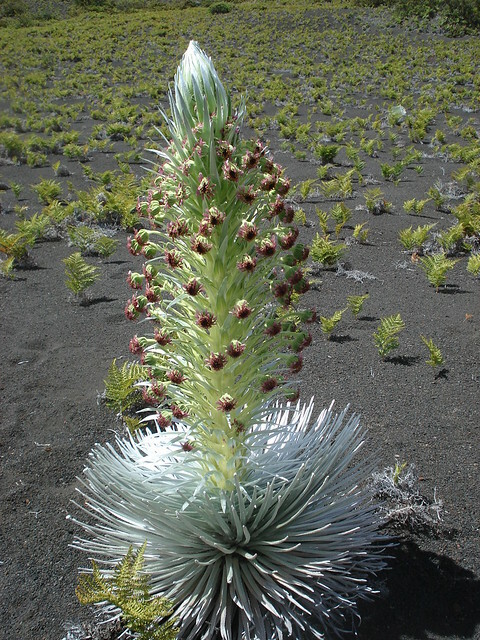 These unique plants are indigenous to the crater and are protected. Even though they can withstand the harsh environment of Haleakala, they are quite fragile. Look, but don’t touch. Paliku is the first campsite, about 9 miles into the crater. The elevation change is about 2500 feet lower so you will see more vegetation. 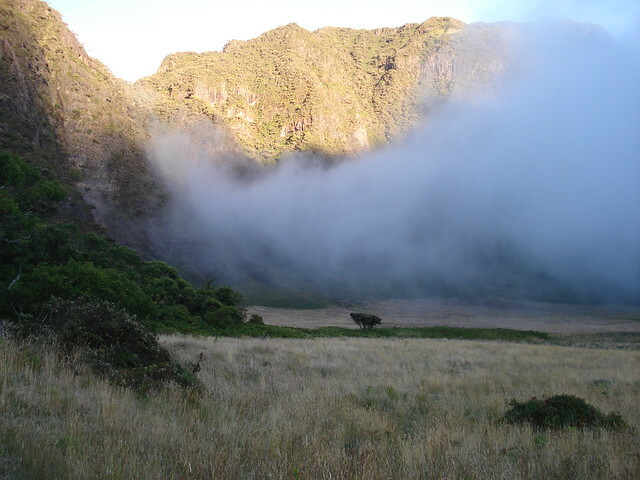 After setting up camp we were amazed by watching mist drop from the side of the steep cliffs as if it were poured into the crater. As the sun dipped below the horizon, the night sky was illuminated by brilliant stars. With no artificial lights around, our eyes adjusted to the darkness easily and we saw more stars than we could imagine. The next morning’s sunrise was spectacular. 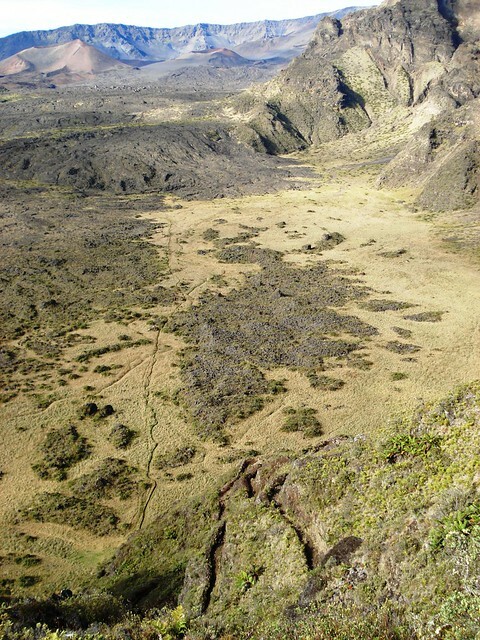 The second day of hiking is a gradual 6 mile climb back up through lava fields on the Halemau`u trail. 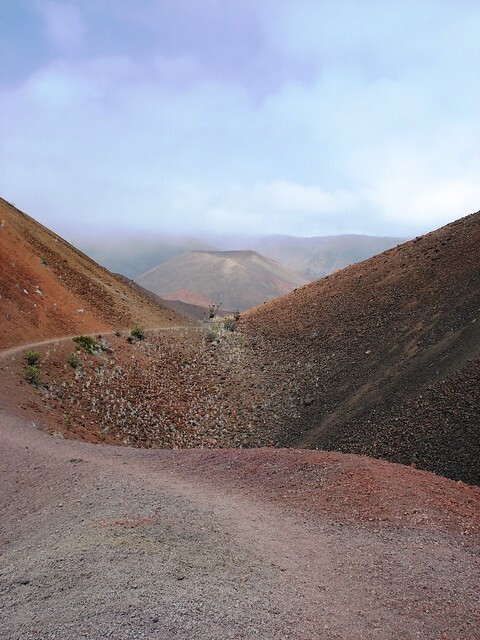 You’ll wind between more vibrantly colored cinder cones with shades of red and orange. The next campsite is Holua. We set up our tent just as a storm rolled in. It reminded us of how fast the weather can change out here. On day three we caught another amazing sunrise before packing up. The hike out is about 3.8 miles. It starts out flat at first, then quickly steepens as you switchback several times up the cliff. Pause for a moment and look back at the majestic valley below. Your hike ends at the Halamau`u trailhead and back to your car. This was first posted on Cheapoair.com (offering cheap tickets), where I guest blogged. Posted by jingerventures on November 27, 2011 in All adVentures, Hawaii and tagged Backpacking, Hawaii, Hiking. Good idea. I’ll look for the widgit. Still new at this! Sounds like fun. And you got beautiful photos. Wish I’d done this during at least one of my two visits to Maui. Thanks! You’ll have to put it on the list the next time you visit Maui!